Background: Cardiac rehabilitation (CR), despite numerous evidence of a positive impact on morbidity and mortality, still remains underutilized due to multifactorial reasons. Physician endorsement has been shown to be a very powerful predictor of CR referral. The objective of the study was to describe physicians' attitudes and preferences regarding referral of patients to CR. Methods: A cross-sectional survey of a stratified random sample of 160 physicians specializing in cardiology was conducted at the Philippine Heart Center. One hundred and four physicians responded (65% response rate) to a survey that investigated clinical factors and perceptions affecting referral. Included in the survey was a hypothetical case scenario that elicited open-ended responses affecting physician management preferences. Results: About 78.9% of the physicians stated that they would refer the hypothetical case to CR although there were varied responses in their management practices. The most important factor affecting CR referral was financial limitation, followed by geographic location and issues on program accessibility and benefit. While there is general agreement regarding knowledge of the indications of CR, there is a disparity in the responses with regard to actual referral and management preferences. Conclusions: Financial considerations, accessibility, perceived benefit, and health-care system-related aspects are some of the identified factors that affect physician preferences toward referral to CR. Assessment of physician attitudes and factors affecting CR referral practices provides insight regarding potential targets of improvement to ensure adequate CR referral and provision. Questionnaires are valuable instruments to obtain information from respondents. Validated tools capable of assessing the level of knowledge in referral practices to CR have not yet been described in our setting. The Attitude toward CR Referral Scale (ACRRS) was developed by Grace et al. and consisted of 19 items with a five-point Likert-type scale for ranking responses, followed by one open-ended question. The factors included had previously undergone principal components analysis as well as assessment for discriminant validity. In this regard, we hope to be able to use this tool in the acquisition of knowledge regarding physician attitudes which may help enable us to overcome the barriers that result in low referral to CR. To determine the barriers that physicians face in referring patients to CR. A random sample of physicians from the Philippine Heart Center (PHC) was the target population, especially targeting those involved in CR referral (cardiologists, cardiac surgeons, and training fellows). The original author (Dr. Sherry Grace) was contacted via email and gave consent to use the scale for our research purposes. We modified the first part of the scale by changing the descriptive demographics of the respondent to fit the characteristics of our study population. The first part of the questionnaire involves a hypothetical case scenario where the respondents will be asked to consider whether they would refer the patient for CR [Figure 1]. In addition, included in the survey are 19 validated items scored on a five-point Likert-type scale. 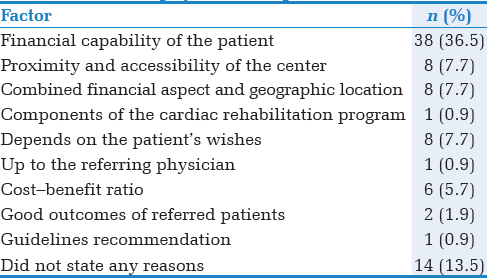 The final item is an open-ended question that asked the physician to list the most important factor that influences their decision to refer patients for CR. The responses of the physicians were then collected for qualitative analysis. The estimated sample size was computed based on the rule of 10 by Garson,  which states recruitment of at least 100 subjects or a sample of 10 for every items for a minimum of 190 subjects, with alpha of 0.05 and standard error of 5%. For descriptive analysis of the characteristics of respondents, quantitative variables were presented as frequency and percentage and quantitative variables were presented as mean and standard deviation. Qualitative responses generated by the physicians were coded. All analyses were performed using STATA SE version 13 (StataCorp LP, Texas, USA). The study was conducted in compliance with the ethical principles set forth in the declaration of Helsinki. Informed consent was given by the respondents prior to study participation. The study protocol was reviewed and approved with subsequent amendments by the PHC Institutional Ethics Review Board. There were 104 respondents out of 160 questionnaires that were distributed for a response rate of 65%. The characteristics of the responding participants are shown in [Table 1]. The mean age was 41.1 ± 11.0 years; 59.6% of the respondents were male, and the mean number of years in practice was 8.7 ± 10.3. Of the 104 participants, 25.9% were adult cardiology fellows, 9.6% were cardiac surgeons, 13.5% were general cardiologists, and 5 (4.8%) were electrophysiology specialists. 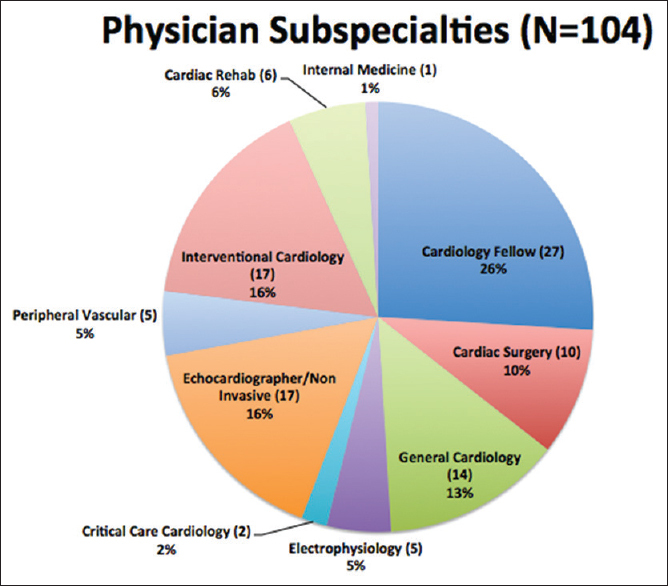 Two (1.9%) respondents were critical care specialists, 17 (16.4%) were noninvasive echocardiographers and interventional cardiologists, respectively, 6 (5.8%) specialized in CR, and one was an internist [Figure 2]. 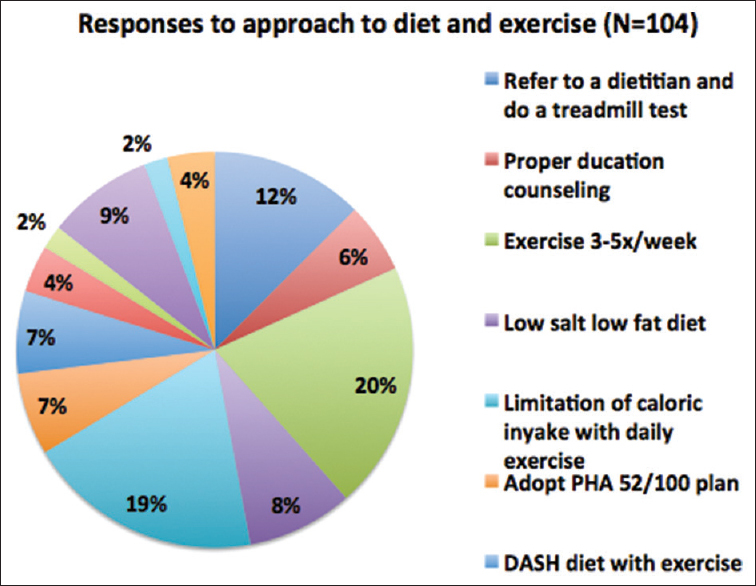 The responses for the approach to diet and exercise counseling are visually summarized in [Figure 3]. When asked what approach they would take to diet and exercise counseling of the hypothetical cardiac patient, 13 (12.5%) said that they will refer the patient to a dietitian and do a treadmill test, 6 (5.7%) said that they will do proper education counseling, 21 (20.2%) said that they will advise exercise 3-5 times a week, 9 (8.6%) said that they would recommend a low salt and low fat diet, 20 (19.2%) stated limitation of caloric intake with daily exercise, 7 (6.7%) said that they will adopt the PHA 52/100 plan (this is a national program of the Philippine Heart Association in advocating an active and healthy lifestyle), 7 (6.7%) stated a combination of the DASH diet and exercise, while 4 (3.8%) recommended a diet high in fruits and vegetables, 2 (1.9%) said that they will enroll patient to an aerobics class with diet instructions, 9 (8.7%) said that they would refer the patient to CR, 2 (1.9%) stated that they would assess psychosocial factors and finally 4 (3.8%) did not answer the hypothetical case scenario. When asked whether they would refer the hypothetical cardiac patient to CR, 82 (78.9%) responded yes and 22 (21.1%) said no. Open-ended questions for referral or nonreferral were coded. The reasons for referring the hypothetical patient are illustrated in [Figure 4] with rounded-off percentages. When asked why they would refer, 10 (12.2%) stated because of a detailed and systematic approach to exercise prescription and guidance, 3 (3.6%) reported that it is due to its comprehensive and multifactorial approach, 15 (18.3%) cited improvements in outcomes and mortality, 2 (2.4%) said that all cardiac patients should be referred, another 2 (2.4%) said that as long as the patient can afford it, 3 (3.7%) cited because of better follow-up and compliance, 8 (9.7%) said that it enables patients to meet secondary prevention and lifestyle goals, 9 (10.9%) said because it is a Class I indication, and 21 (25.6%) did not give any reason. 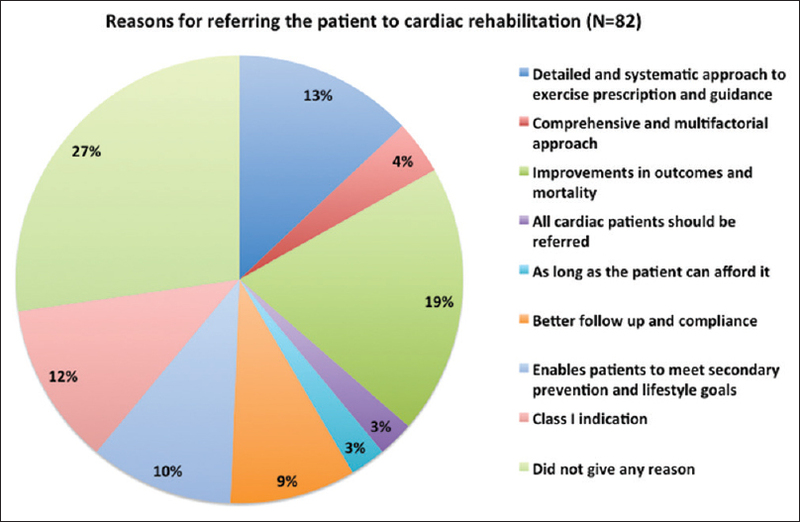 [Figure 5] shows the breakdown of reasons why the respondents would not refer the patient. 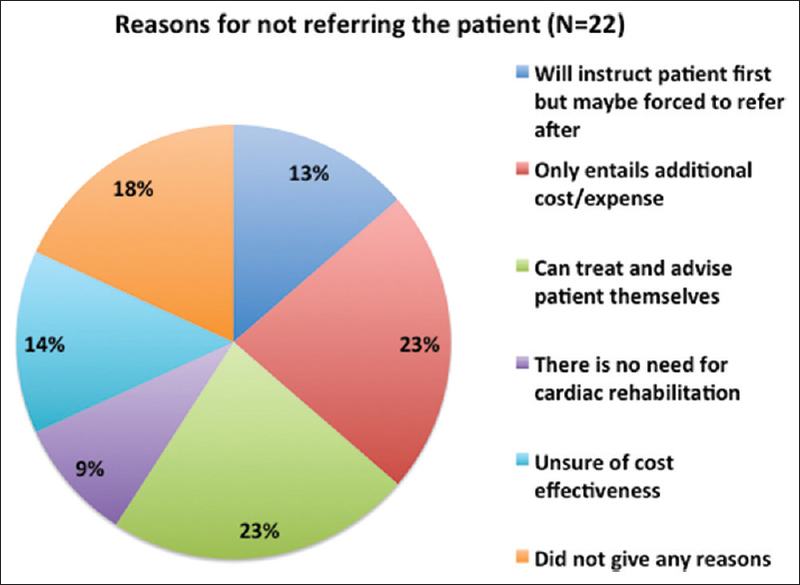 When asked why they would not refer, 3 (13.6%) said that they will instruct patient first but maybe forced to refer after, 5 (22.7%) said that it just entails additional cost, another 5 (22.7%) stated that they can treat and advise patients themselves, 2 (9.1%) said that there is no need for CR, 3 (13.6%) said that they are unsure of cost effectiveness, and 4 (18.1%) declined to give any reason. When the physicians were asked what were the most important factors affecting referral to CR, 38 (36.5%) stated financial capability of the patient, 8 (7.7%) stated proximity and accessibility of the center, another 8 (7.7%) cited a combination of both financial and geographic location, 1 (0.9%) stated the components of the CR program, and 8 (7.7%) stated that it depends on the patient's wish for referral. Two respondents (1.9%) cited the patient's ability to comply with the program, 12 (11.5%) cited the clinical status of the patient, 3 (2.8%) cited lack of awareness for CR program, 1 (0.9%) said that it is up to the referring physician while 6 (5.7%) stated the cost-benefit ratio. There were 2 (1.9%) respondents who cited good outcomes of patients who were referred, 1 respondent (0.9%) stated because of the guidelines, and 14 (13.5%) respondents did not give any reason [Table 2]. Additional comments from the respondents included recommendations of providing educational materials and educate the health-care provider, discuss with insurance regarding availability and affordability, move to a more accessible location, and limit the cost of CR. Other comments include not being in favor of no weekend clinics, patients not being seen right away, and the aspect of having a group practice. The interpretations of the items ranged from strongly agree to strongly disagree [Table 3]. The data from the Likert-type scale items are presented in [Table 4] in descending mean scores. Based on the mean scores, 61.4% of the respondents answered strongly agree that clinical practice guidelines promote referral to CR while 54.8% agree that they generally refer patients to CR. About 65.9% agree that reimbursement policies are a financial disincentive to CR referral. There were 74.2% who agreed that their department generally refers patients to CR as standard care while 74.7% agree that they prefer to manage the patient's secondary prevention by themselves. With regard to knowledge of their colleagues referral to CR, familiarity with CR sites in their area or outside their area, handling of CR referral by another healthcare professional, use of patient education materials, and regarding self-prescription of exercise regimen, most responses were on the neutral side of the scale. Finally, 95.7% of the respondents disagree that female patients generally do not like to exercise, 95.4% disagree that it is inconvenient to make a referral to CR, 99.6% disagree that the available CR is of poor quality, and 99.7% disagree that they have had a bad experience with a CR program. Despite the established benefits of CR, referral rates remain suboptimal. In the PHC, a national cardiology referral center in the Philippines, it is estimated that <30% of all eligible patients are referred. While the reasons are multifactorial involving patient, provider, and system levels, physician endorsement and failure of physicians to refer have been known as a key factor affecting patient participation in CR. In particular, physician referral at the time of discharge is a powerful predictor of CR attendance. Thus, it is prudent to study physician perceptions and attitudes which could affect their referral practices. The results of the study showed that generally physicians have a positive attitude response toward CR referral, with 78.9% stating that they would refer the hypothetical case to CR and 61.4% strongly agreeing that clinical practice guidelines promote referral. In addition, the reasons cited for referring the hypothetical patient imply that most of the positive responders are aware of the benefits of CR, many of which are based on evidence in the literature. Furthermore, based on the Likert-type responses, majority of the physicians disagree regarding skepticism of the benefits of CR, the quality of the program, and inconvenience of referral, most of them (99.7%) stating that they have never had a bad experience with the program. However, one question of the Likert scale, which asked whether colleagues generally refer patients to CR, was mostly answered with a neutral response (77.4%). Beckstead et al., who used the same scale we used in our study, noted this disparity in a similar manner. The researchers noted that the correlation between the attitudes and judgment of physicians regarding CR referral was only modest. Furthermore, there was actually wide variation regarding the extent of physicians' judgments in relation to attitudes toward CR referral, thus preventing genuine agreement and uniformity in the selection of patients appropriate for CR  which may lead to low rates of referral and the real-world scenario of low utilization. The main barrier to CR referral in our study is financial limitation. This was the answer given by 36.5% of the respondents with 65.9% agreeing that reimbursement policies being a financial disincentive to CR referral. This was also answered by 2.4% of the respondents who will refer the hypothetical case, stating that "as long as the patient can afford it" and by 22.7% of respondents who opted not to refer the hypothetical case, saying that "it just entails additional cost." While the global burden of cardiovascular disease (CVD) and the problem of limited resources is considerable, it should be noted that even in high-income countries such as the USA or UK, cardiac rehabilitation, despite a Class IA recommendation in clinical guidelines and significantly lower cost, is being utilized less compared to other treatments such as coronary artery bypass, percutaneous catheter intervention, and even other forms of guideline-directed secondary prevention therapies. Governments allocate more resources to the acute treatment of CVD than to less expensive, long-term disease management such as CR. The cost of CR provision of many lower middle-income countries is unknown, and there are no studies of cost-effectiveness of CR in our local setting. This can be a future direction for research which can provide data for physicians as well as policymakers and insurance companies. Our study is limited by the fact that it is a single-center study using the Philippine Heart Center model of care which may limit generalizability as we are not aware of how referral practices are carried out in other institutions. Our population consisted of cardiac specialties and other primary care physicians may have been underrepresented. Second, the response rate while technically considered adequate (65%) also had many items that were unanswered items. Despite our best efforts of following up, there was still a 35% nonresponse rate, indicating either refusal, nonresponse bias, nonparticipation, and possibly even negative attitudes which may have not been fully represented or explored. However, studies have shown that it is not valid to focus on response rates alone in determining the quality of survey data. The responses we have obtained offer many meaningful insights and data regarding physician perceptions. Finally, with regard to the use of a hypothetical case scenario, previous research  has supported the validity of hypothetical scenarios in which physicians actually respond in a manner, in which they would be expected to respond in a real world scenario. However, these findings need to be replicated with further research and should involve a multicenter or even a national approach to provide further evidence. The present study is the first of its kind to examine a comprehensive list of physician-related factors affecting CR referral in the Philippines. Clearly, there is a need to improve referral and delivery of CR while maximizing available resources so that patients can maximize its benefits and the role of the referring physician is critical. The paper of Balady et al. provides a useful guide and may involve health-care and policy reforms, innovative delivery systems, and improved insurance and cost reduction strategies. There is a need to promote knowledge and optimization of CR referral at the physician level while working around other logistical barriers. Physicians should be encouraged to refer eligible patients based on clinical criteria and guideline indications rather than on perceived patient characteristics and preconceived limitations. Despite the burden of evidence of benefit of CR compared to other therapies, there is a disparity regarding the attitudes and general knowledge of physicians with referral practices and preferences in management. The most important reasons for referring patients among physicians include perception of financial aspect as well as factors involving patient, provider, and system levels. The importance of the role of the physician in improving referral to CR cannot be overemphasized. Identification of physician barriers and attitudes is an important aspect that we can determine and work on to circumvent the problem of low CR referral. The authors would like to thank Professor Sherry Grace of York University for her invaluable input and contribution to this paper. Mampuya WM. Cardiac rehabilitation past, present and future: An overview. Cardiovasc Diagn Ther 2012;2:38-49. Leon AS, Franklin BA, Costa F, Balady GJ, Berra KA, Stewart KJ, et al. Cardiac rehabilitation and secondary prevention of coronary heart disease: An American Heart Association scientific statement from the council on clinical cardiology (subcommittee on exercise, cardiac rehabilitation, and prevention) and the council on nutrition, physical activity, and metabolism (subcommittee on physical activity), in collaboration with the American association of cardiovascular and pulmonary rehabilitation. Circulation 2005 25;111:369-76. Thomas RJ, King M, Lui K, Oldridge N, Piña IL, Spertus J. AACVPR/ACCF/AHA 2010 update: Performance measures on cardiac rehabilitation for referral to cardiac rehabilitation/secondary prevention services: A report of the American Association of Cardiovascular and Pulmonary Rehabilitation and the American College of Cardiology Foundation/American Heart Association Task Force on Performance Measures (Writing Committee to Develop Clinical Performance Measures for Cardiac Rehabilitation). Circulation 2010;122:1342-50. Suaya JA, Shepard DS, Normand SL, Ades PA, Prottas J, Stason WB. Use of cardiac rehabilitation by Medicare beneficiaries after myocardial infarction or coronary bypass surgery. Circulation 2007;116:1653-62. Higgins RO, Murphy BM, Goble AJ, Le Grande MR, Elliott PC, Worcester MU. Cardiac rehabilitation program attendance after coronary artery bypass surgery: Overcoming the barriers. Med J Aust 2008;188:712-4. Brown T, Hernandez AF, Bittner V, Cannon CP, Ellrodt G, Liang L, et al. Predictors of cardiac rehabilitation referral in coronary artery disease patients: Findings from the American Heart Association's get with the guidelines program. J Am Coll Cardiol 2009;54:515-21. Grace SL, Evindar A, Abramson BL, Stewart DE. Physician management preferences for cardiac patients: Factors affecting referral to cardiac rehabilitation. Can J Cardiol 2004;20:1101-7. Garson GD. Testing statistical assumptions. 2012 ed. Asheboro, NC: Statistical Associates Publishing; 2012. Ades PA, Waldmann ML, McCann WJ, Weaver SO. Predictors of cardiac rehabilitation participation in older coronary patients. Arch Intern Med 1992;152:1033-5. Parkosewich JA. Cardiac rehabilitation barriers and opportunities among women with cardiovascular disease. Cardiol Rev 2008;16:36-52. Lawler PR, Filion KB, Eisenberg MJ. Efficacy of exercise-based cardiac rehabilitation post-myocardial infarction: A systematic review and meta-analysis of randomized controlled trials. Am Heart J 2011;162:571-84.e2. Beckstead JW, Pezzo MV, Beckie TM, Shahraki F, Kentner AC, Grace SL. 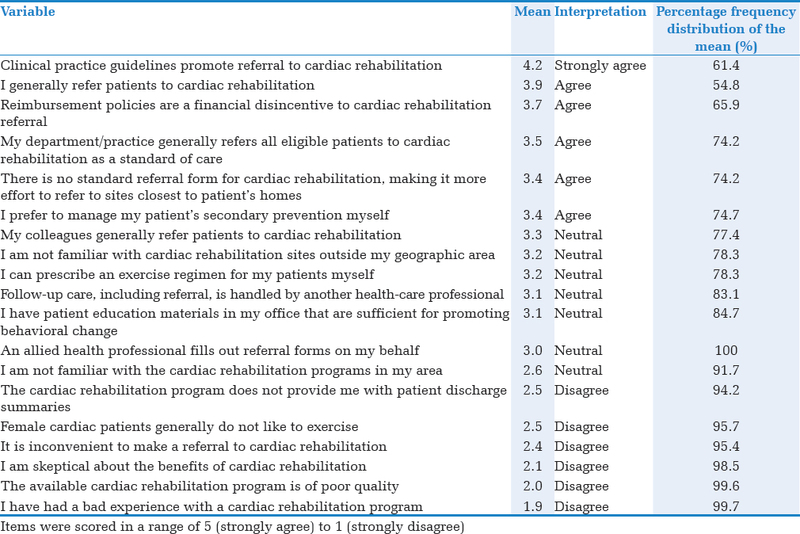 Physicians' tacit and stated policies for determining patient benefit and referral to cardiac rehabilitation. Med Decis Making 2014;34:63-74. Ghisi GL, Polyzotis P, Oh P, Pakosh M, Grace SL. Physician factors affecting cardiac rehabilitation referral and patient enrollment: A systematic review. Clin Cardiol 2013;36:323-35. Arthur H. Improving secondary prevention of cardiovascular disease through increased referral to cardiac rehabilitation. J Clin Outcomes Manag 2006;13:572-7. Moradi B, Maleki M, Esmaeilzadeh M, Abkenar HB. Physician-related factors affecting cardiac rehabilitation referral. J Tehran Heart Cent 2011;6:187-92. Gallagher R, Neubeck L, Du H, Astley C, Berry NM, Hill MN, et al. Facilitating or getting in the way? The effect of clinicians' knowledge, values and beliefs on referral and participation. Eur J Prev Cardiol 2016. pii: 2047487316630085. [Epub ahead of print]. Turk-Adawi K, Sarrafzadegan N, Grace SL. Global availability of cardiac rehabilitation. Nat Rev Cardiol 2014;11:586-96. Goto Y, Saito M, Iwasaka T, Daida H, Kohzuki M, Ueshima K, et al. Poor implementation of cardiac rehabilitation despite broad dissemination of coronary interventions for acute myocardial infarction in Japan: A nationwide survey. Circ J 2007;71:173-9. Lee S, Brown ER, Grant D, Belin TR, Brick JM. Exploring nonresponse bias in a health survey using neighborhood characteristics. Am J Public Health 2009;99:1811-7. Langley GR, Tritchler DL, Llewellyn-Thomas HA, Till JE. Use of written cases to study factors associated with regional variations in referral rates. J Clin Epidemiol 1991;44:391-402.